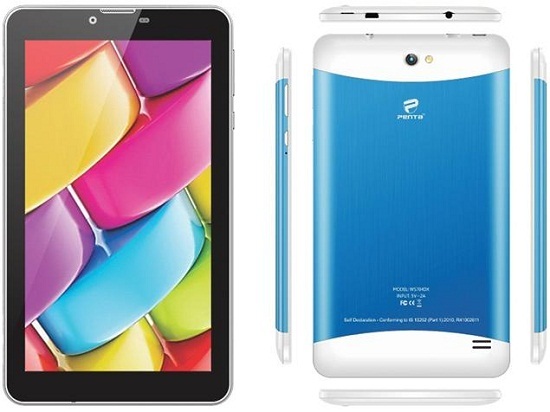 Pantel Technologies has launched a budget tablet in India dubbed Penta T-Pad WS704DX which supports 3G. It had been priced Rs. 4999 and will be exclusively available at Homeshop18. Pantel has earlier launched BSNL tablet in year 2012. Tablet runs Android Kitkat v4.4. It features 7-inch display with pixel resolution of 1024 * 600 and has been powered by dual core processor clocked at 1.3 GHz coupled with 1 GB of RAM. It packs 8 GB of inbuilt storage which can be expanded via. microSD card upto 32 GB. It has got dual SIm slots supporting 3G and can be used for voice calling. Connectivity includes Wi-Fi, Bluetooth, USB OTG and microUSB connectivity. It sports 2 MP cameras with LED flash on the back and 0.3 MP cameras at front. Battery is of 3000 mAh. Keeping in track of the device under Rs. 5,000 for last few days. Penta T-Pad WS704DX has been primarily designed as substitute to Spice Mi-730. Both tablets are priced under 5000 and bears similar specification.